[Notice] [Updated April 15] LINE FRIENDS Comes to MapleStory! 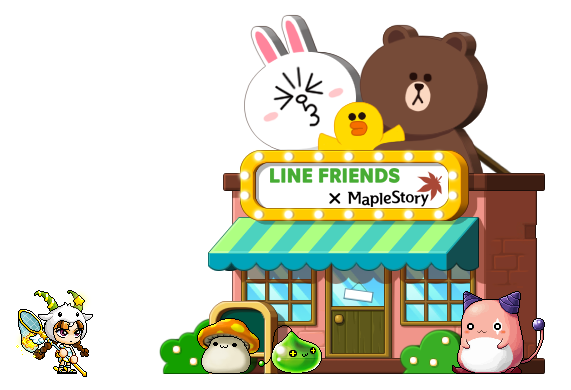 [Updated April 15] LINE FRIENDS Comes to MapleStory! Thread: [Notice] [Updated April 15] LINE FRIENDS Comes to MapleStory! The LINE FRIENDS characters are coming to MapleStory for a special co-promotion with tons of new events and rewards! Participate in these events to earn LINE FRIENDS Coins, which can be used in the LINE FRIENDS Coin Shop! Answer questions about your favorite MapleStory and LINE FRIENDS characters for rewards in this special event! Player Lv. 10 or higher can participate by visiting our LINE FRIENDS page here. A new poll will go up at 6:00 PM UTC every Monday, Wednesday, and Friday from April 10 through April 26. You’ll have until the next poll goes up to give your vote, with the final poll closing at 5:59 PM UTC on April 29th. The rewards are cumulative, so the more polls you complete, the more prizes you’ll rack up! There are plenty of rewards to earn so visit our LINE FRIENDS site to start voting! Meet the LINE FRIENDS characters by accepting the “The LINE FRIENDS characters have come to visit Maple World!” quest! Take pictures all around Maple World in A Surplus of Snapshots! Players Lv. 61 and above can be begin by talking to NPC CONY located in major towns, or by clicking the LINE FRIENDS event notifier on the left side of the screen. Select the ‘[LINE FRIENDS] Worth a Thousand Words’ quest to participate. NPC CONY will give you an InstaCam that can be used once every 5 minutes to take a picture! CONY wants three different kinds of pictures from Maple World: famous people, famous places, and famous monsters. Every day she’ll ask that you take three pictures from one of those categories. If you return to her with three pictures of what she asked for that day, you’ll receive the following rewards. LINE FRIENDS Coins (x10): Receive this reward if you have earned all ten stickers. LINE FRIENDS Coins (x10): Untradeable. LINE FRIENDS Coins (x5): Untradeable. Hyper Teleport Rock (1 Day) Coupon: Untradeable, 1-day duration. 2x EXP Buff Coupon (15 min): Untradeable, 1-day duration. 3x EXP Buff Coupon (30 min): Untradeable, 1-day duration. 2x Item Drop Rate Coupon (15 min): Untradeable, 1-day duration. BROWN Atmospheric Effect: Untradeable, 1-day duration. CONY Atmospheric Effect: Untradeable, 1-day duration. SALLY Atmospheric Effect: Untradeable, 1-day duration. JAMES Atmospheric Effect: Untradeable, 1-day duration. LEONARD Atmospheric Effect: Untradeable, 1-day duration. Mysterious Meso Pouch (x5): Untradeable. If you collect all ten of the special LINE FRIENDS Stickers, you’ll also get a special medal! LINE FRIENDS Bestie: Medal. Grants STR/DEX/INT/LUK +10, Weapon ATT/Magic ATT +3, MaxHP/MaxMP +500. Stats have a duration of 28 days. Help NPC CONY gather items during her visit to Maple World! Players Lv. 61 and above can participate by clicking the LINE FRIENDS event notifier and on the left side of the screen and then selecting the ‘[LINE FRIENDS] A Suitcase Full of Souvenirs’ quest to participate. There are 14 total item quests altogether, and you can gather one type of item for NPC CONY per day. If you have trouble finding the item in question, talk to NPC Cassandra for help. She’ll allow you to collect Maple World Leaf items instead, and then reward you with the item CONY wants. Every time you complete the daily quest for CONY, you’ll receive a LINE FRIENDS Gift Box! Once you collect all 14 items, you’ll receive the following reward! CONY’s Gofer: Title. Grants STR/DEX/INT/LUK +10, Weapon ATT/Magic ATT +3, MaxHP/MaxMP +500. 28-day duration. Hunt monsters in this daily quest so the LINE FRIENDS characters can safely explore Maple World! Players Lv. 61 and up can participate by clicking the LINE FRIENDS event notifier on the left side of the screen and then selecting the ‘[LINE FRIENDS] Danger is SO Last Week’ quest to participate. Hunt 500 monsters near your level range (20 levels above or below your level) each day to receive a reward! Every time you complete the quest you’ll receive a LINE FRIENDS Gift Box! Eternal Rebirth Flame: Untradeable. 10-day duration. Limit: 1. Price: 40 coins. Epic Potential Scroll 100\%: Untradeable. 10-day duration. Limit: 1. Price: 40 coins. Bonus Potential Scroll 50\%: Untradeable. 10-day duration. Limit: 3. Price: 25 coins. Perfect Potential Stamp: Untradeable. Permanent. Limit: 3. Price: 10 coins. Pure Clean Slate Scroll 100\%: Untradeable. 10-day duration. Limit: 1. Price: 10 coins. Experience Nodestone: Untradeable. Permanent. Limit: 1. Price: 80 coins. Nodestone: Untradeable. 10-day duration. Limit: 10. Price: 10 coins. Trait Boost Potion: Untradeable. 10-day duration. Limit: 1. Price: 40 coins. Pollo and Fritto Entry Ticket: Untradeable. 1-day duration. Limit: 1 per day. Price: 10 coins. Prepared Pendant of the Spirit (14 Day): Untradeable. Limit: 1. Price: 40 coins. Pendant Slot Coupon (30 Day): Untradeable. 10-day duration. Limit: 1. Price: 20 coins. Permanent LINE FRIENDS Sticker Coupon: Untradeable. 10-day duration. Limit: 10. Price: 50 coins. Use to obtain 1 random sticker. Boppin’ LINE FRIENDS Truck Mount Coupon: Untradeable. 10-day duration. Limit: 1. Price: 150 coins. Mount received from coupon has a 90-day duration. MOON Scooter Mount Coupon: Untradeable. 10-day duration. Limit: 1. Price: 300 coins. Mount received from coupon is permanent. Chillin’ with LINE FRIENDS Bench: Untradeable. Permanent. Limit: 1. Price: 200 coins. *Limit 1 of each gift item per event-registered account. An additional gift item will be given to all participating accounts based on the highest community goal reached during the event period (beginning April 10, 2019 at 11 AM PT and ending April 29, 2019 at 11 AM PT). Only available to accounts in good standing that have a Level 10 character or higher. Gifts will be distributed in-game to all confirmed eligible registrants approximately 1 week after the end of the event. All gifts must be claimed by a character Level 10 or higher. All gifts must be claimed in-game by May 22, 2019 at 4:59 PM PT and will expire thereafter if not claimed. Gifts are not transferable. Nexon America Inc.’s computers will be the official time-keeping devices. *All dates and times in Pacific Time. Entrants are responsible for calculating the difference in time zones. Nexon may cancel, terminate or alter the Program and these Program rules at any time in its sole discretion, with or without notice. [Updated April 10] LINE FRIENDS Comes to MapleStory! [Updated April 10] Please note that if you obtain one of the souvenir items and then drop it, you'll have to forfeit and re-accept the '[LINE FRIENDS] A Suitcase Full of Souvenirs' quest in order for monsters to drop the items again (with the exception of Potions and Spell Trace items). Last edited by SaptaZapta; 2019-04-11 at 12:12 AM. [Updated April 11] LINE FRIENDS Comes to MapleStory! 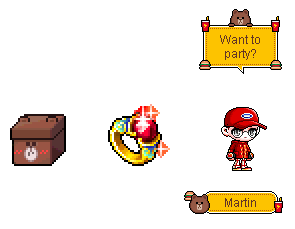 [Updated April 10]*Please note that if you obtain one of the souvenir items and then drop it, you'll have to forfeit and re-accept the '[LINE FRIENDS] A Suitcase Full of Souvenirs' quest in order for monsters to drop the items again (with the exception of Potions and Spell Trace items). [Updated April 11] The stats for the CONY's Gofer title were listed incorrectly. The stats have been updated. CONY’s Gofer: Title. Grants STR/DEX/INT/LUK +15. 28-day duration. 28-day duration. Last edited by SaptaZapta; 2019-04-12 at 12:02 AM. [Updated April 15] The 3x EXP Buff Coupon was previously listed as having a 30-minute duration rather than its intended 15-minute duration. This has been corrected. 3x EXP Buff Coupon (15 min): Untradeable, 1-day duration. [Updated April 11]*The stats for the*CONY's Gofer*title were listed incorrectly. The stats have been updated. CONY’s Gofer: Title. Grants STR/DEX/INT/LUK +15. 28-day duration. Last edited by SaptaZapta; 2019-04-15 at 11:27 PM.